The iPhone producer's work in the field of augmented reality has led to many reports over the years claiming a headset or smart glasses that take advantage of the technology is in development. According to a note to investors from Ming-Chi Kuo, it may arrive sooner than people think. In the note, Kuo believes the mass production of Apple's product may start in the fourth quarter of 2019, though it is suggested this window stretches into the second quarter of 2020. It is unknown when the device will launch, but the timing of manufacturing certainly suggests sometime during 2020. The timeline for its release, according to Kuo, is somewhat optimistic and relatively near term. In May 2018, Loup Ventures' Gene Munster suggested Apple won't bring out an AR wearable device until late 2021, a revision of earlier speculation that tipped a September 2020 launch. Kuo claims the first generation of Apple's AR glasses will only act as a display, with a nearby iPhone performing all of the processing, including rendering scenes, providing a data connection, and location-based services like GPS. It is unclear if the accessory would be connected by a cable or take the wireless route and use Bluetooth, Wi-Fi, or another similar technology for close-range communications. The described hardware, with processing offloaded to an iPhone held separately, could potentially result in an extremely light headset, at least in comparison to current-generation VR headsets and versions that slot an iPhone or another smartphone into a frame for use as a display. 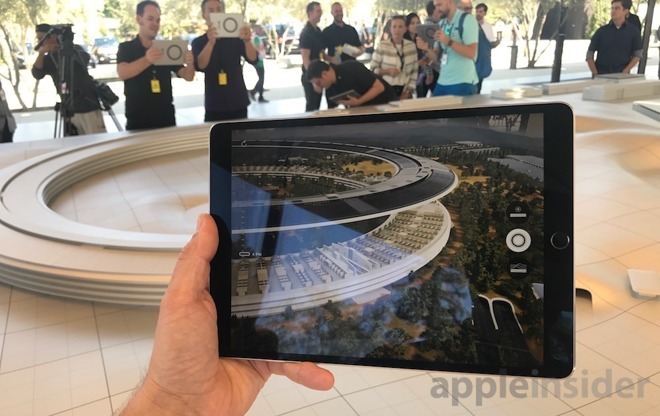 As it already is used to power ARKit experiences, an iPhone is more than capable of performing processing for a connected headset, but the system does raise questions about how the connection with the host mobile device will function, as well as power concerns for both the headset and the iPhone. One earlier rumor for the headset suggested it would use 60-gigahertz WiGig to make a connection with a host without cables. The connection would certainly provide the throughput required for video and other data needed for AR glasses to function, but it would limit the device to working either with a future iPhone model with WiGig support built in or some form of adapter would be required for use with older iPhone models. The same rumor also speculated the use of extremely high resolution eyepieces, offering an 8K resolution for each eye. Not only is this beyond current Apple hardware, but also far exceeds the resolution of existing AR and VR headsets, such as the Vive Pro's 1,440-by-1,600 pixels per eye. The high resolution seems doubtful at this stage, as it would not only put pressure on the data connection with the iPhone, but the increased graphical requirements would mandate a considerable processing upgrade for the iPhone. That seems like a hell of a lot of data that you're shunting over a wireless connection, and in a situation where any lag will destroy the experience. Colour me sceptical, firstly of the report and then of the system. If gaming I would agree you have a point. For navigating/wayfinding, shopping experiences, video calls, training services, repair assistance, and other such stuff companies who are currently selling use a wireless connection to their smart glasses with wifi and bluetooth over cellular both supported. I doubt many readers have any idea that anyone other than Google Glass even offers smart glasses today, but there's actually quite a few. Are you talking about Google Glass? I think that was a pretty limited version of AR, and if that's all that Apple's version ends up being then it'll be a major disappointment. I'm talking more about the Apple Glasses having to transmit back information from multiple cameras, and the phone having to process depth of field mapping information and then send back instructions on where to render 3D objects, in very high resolution. That seems like a different order of magnitude than rendering the basic stuff that Google Glass did. If you're not talking about GG then a link to what you are talking about would be appreciated. HTC Vive has a wireless option so it is certainly possible. Like the Vive, Apple could use WiGig for communication with the iPhone/iPad/Mac. It also means Apple wouldn’t need another radio since the same Wi-Fi chipset/antennas are used to implement. Apple has tight control over the gpu, so maybe some processing would be on the phone and some in the headset. I wonder if light-fields (streaming video you can walk around a small area- Otoy and Facebook have been working on 3D rendering and camera tech) will be ready for the mainstream around the time of release. It could provide another use for the headset and up the quality for low-power use graphics by pre-rendering or compositing real-time graphics on top of a light-field. They have been close for a few years. This is different then light-field projection to the eye (multiple areas of focus for the eye). Killer apps or it would be a waste of time. Again, pretty basic stuff, that would be a waste of all the work Apple have put in with ARKit. I imagine Apple are aiming much more at the HoloLens end. I could be wrong, obvs. If the 8K per eye rumors are true then there will be. That is considered the holy grail of AR/VR. That resolution is near retina. At a minimum it could give you a movie theatre size screen anywhere. Current headsets are toys mainly because resolution prevents them from replacing existing tech. I can’t even begin to imagine what these will be for. People assume it’ll be to augment everyday life, like the Google glasses, but I don’t think so. We’re moving away from the push toward that level of personal dependence on technology. Well, I hope at least. I saw this coming a mile away when they mention the iPhone being used for AR Goggles. It was so dead obvious when Cook famously said he saw potential on its use and this was almost three years ago. Anything he says or does is marketed around the App Store. I've had problems with the concept of using AR on the iPhone because every time I use a particular app, it would overheat and use up a lot of battery juice ( ditto for iPad Pro ). Another flaw is that when you hold up the iPhone and there's this 3D rendition of, say, a character interacting on screen standing on a surface or table. You can't use your hand and 'touch' it in front of the camera because there is a lack of sensor tech to detect hands. The HoloLens 2 on its own can 'see' your hands with gestures. Using a 2D plane to interact with a 3D environment for AR purposes is somewhat boneheaded. And if ( a big IF ) the AR Goggles has a sensor to scan in hands to interact with the 3D AR objects, then this is what Apple should have released in the very first place! Apple's idea of using an iOS device to hold up for AR use is asinine and I have never, I mean, NEVER seen anyone locally hold up an iPhone or iPad just for that. The only exception would be the Ingress game in my experience which is AR, a bit older than Pokemon Go and doesn't require holding up a phone in front of an object or location. Another concern I have is that the AR Goggles will most likely need to be recharged which makes it the 5th device with a rechargeable battery ( iPhone, iPad, Watch, AirPods and now this one ) running on Bluetooth. As a digital artist myself, I would rather use VR Tilt Brush on Vive or Oculus for 3D project work to experiment with. That sector is growing already with professional artists and designers using VR for this reason. I don't think the base iMac is powerful enough to handle it let alone a PC with Nvidia, nor would anyone want to wait for Apple to catch up on that via the desktop front. I suspect the AR Goggles will probably go for close to $300-400 alone when and IF they release it in 2020, depending on the market situation. I think using 8K would make this device way too expensive. Makes no sense when 4 or 5K is already the standard in the market. And as for current headsets, if you're referring to one such as the Vive as a toy, it's certainly not. I've tried it out two years ago when someone was demo-ing it at an art event and it impressed me with the immersion while I was playing a game. I could even see myself and the crowd behind me with external cameras that track my body movements. The screen resolution was not an issue for me at the time and I'm sure they have improved on it by now. By the time, Apple's Goggles are out, I'll probably be using the Tilt Brush app for VR to do digital 3D sculpting and painting which is what professionals are already using out there now. Goro Fujita, one of the big name illustrators and Art Directors in the field, is already using it for his work using the Quill app. I highly doubt the AR Goggles or iOS device combined is going to be able to process something like this. More likely, the AR Goggles are going to be used for simple apps/games and function that are already on the App Store to transition to. Even with hand detection, that would probably take up more battery juice if the Goggles require recharging which will be a pain in the neck. That thing better have hand detection or interacting with a 3D object with your hands will be a moot point and massive fail. Using a 2D plane like iPhone's screen to interact with a 3D environment/polygons is ridiculous. It's one reason why I have never, EVER seen anyone locally in my area do that for this reason. Microsoft is right about the AR/VR or Mixed Reality as the next computing OS paradigm. They have the right idea regarding HoloLens even though it's expensive, it's a good start towards that direction. 5g radiation blasting near my colon, crotch and on top of my head is not going to be a concern to me whatsoever. I'm honestly just sick of hearing about this guy. I'd wear AR glasses if they could somehow solve the tinting issue - they need to go from clear to tinted without looking completely goofy. The other issue is that now that so many people have Apple Watches, no matter how customised the bands are, they all look so generic. That's not ideal but also not the end of the world on a watch but glasses are even more obvious. I would hope that Apple realise this and can create multiple styles with the same underlying tech. I assume it's easier than building a round watch vs a square one. You must be thinking of VR, not AR. Why do you think it's a "hell of a lot of data"? The only thing that needs to be transmitted is the augmentation. In other words, the display is already in front of you - it's reality. The glasses just have to show whatever augmentation the iPhone decides on based on what the glass' camera sees. What the camera sees can be transmitted to the iPhone easily - Apple has been using AirPlay to transmit video for years. I assume it will use 5G and be continually connected with lower power consumption than 4G. I think folks who think Apple need 8k per eye, 120fps must be thinking immersive VR-style experiences, not AR. For Apple to be successful with a *first* attempt at AR, they simply need to have stylish glasses that display the same information that their ARKit-enabled applications do and some things the phone currently displays (e.g. notifications, emails, texts.) It doesn't need to be fancy. But the glasses need to be stylish - and they need to last all day - just like their phone and their AirPods and their watch. Google had partnered with Warby Parker on custom frames, understanding that not everyone wanted to look the same and not every face was shaped the same way. It was pretty short-lived tho, public perception at the time caused Google to back off the consumer side of the Glass project. Apple partnering up with someone similar and for similar reasons would make sense.